Mrs P is a 79 year old suffering from dementia and was bedridden due to being immobile and knee amputation surgery. She developed a severe pressure ulcer to the sacrum which was managed by being cleaned on a daily basis and packed with a debriding agent, and then covered with a sterile gauze pad and bandage. The pressure ulcer was merely being managed in this manner over the 3 years that the patient had been bed-ridden and showed no signs of healing. 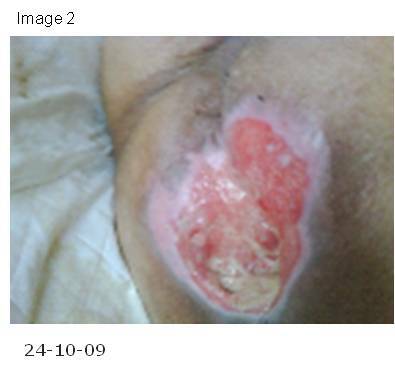 Due to the severity of the pressure ulcer Mrs P’s physician decided to follow a protocol of dry wound healing using Youki Bio-Cell Spray and Youki Skin Repair Cream. The patient’s wound was cleaned to remove all traces of the debriding agent and to ensure that there was no particulate contamination from any other dressing material used and this was left to dry (Image 1). The spray-on dressing was applied and allowed to dry for 10 minutes then the skin repair cream was applied to the surrounding inflamed. The patient’s carer was advised to the following protocol: application of spray-on dressing 8 times a day, allow to dry and then apply protein-rich skin repair cream to the surrounding inflamed skin. Due to the nature of the chronic wound and its position, the wound was shielded using a sterile non-adherent pad which was not allowed to come into contact with the wound site; this ensured that the wound was not disturbed further and followed many of the seven key principles of an ideal wound dressing, i.e. non-adherence, gaseous exchange, freedom from particulate contamination, thermal insulation and protection from trauma. 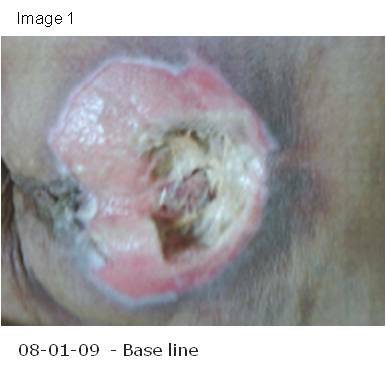 Over the following 16 days the pressure ulcer began to enter the proliferation phase of wound healing and exhibit signs of granulation and remodelling (Image 2). Application of the Youki The Wound Healer Spray-on Dressing continued as directed. 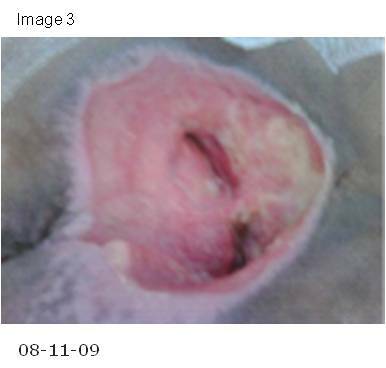 During the next 15 days the wound continued to granulate and exhibited signs of healthy tissue appearing a pink/ red colour (Image 3). Given the severity of the pressure ulcer and the frail condition of the patient. Complete healing was achieved after 217 days after moving to a dry wound healing protocol (Image 4). Clinogen Medical is on the cutting edge of advanced wound management and scar repair Clinogen uses the concept of dry wound healing to provide superior outcomes for both acute and chronic wounds.